April Vollmer is a New York artist who focuses on mokuhanga, Japanese woodcut printmaking. She also makes drawings, collages, books and digital prints. She has lectured widely and her work has been exhibited internationally. She has taught many workshops. Her work has been published in journals including Science, Printmaking Today and Contemporary Impressions and her book: Japanese Woodblock Print Workshop was released by Watson-Guptill in 2015. Offering frequent classes at the Lower East Side Printshop in New York, Vollmer has also given workshops at Japan Society, the Center for Contemporary Printmaking, Pyramid Atlantic, Frogman’s Print and Paper, Cabrillo College, Women’s Studio Workshop and many other locations. She has given lecture demonstrations at SUNY Purchase, the School of Visual Arts and Hunter College, and helped organize exhibitions of contemporary mokuhanga. 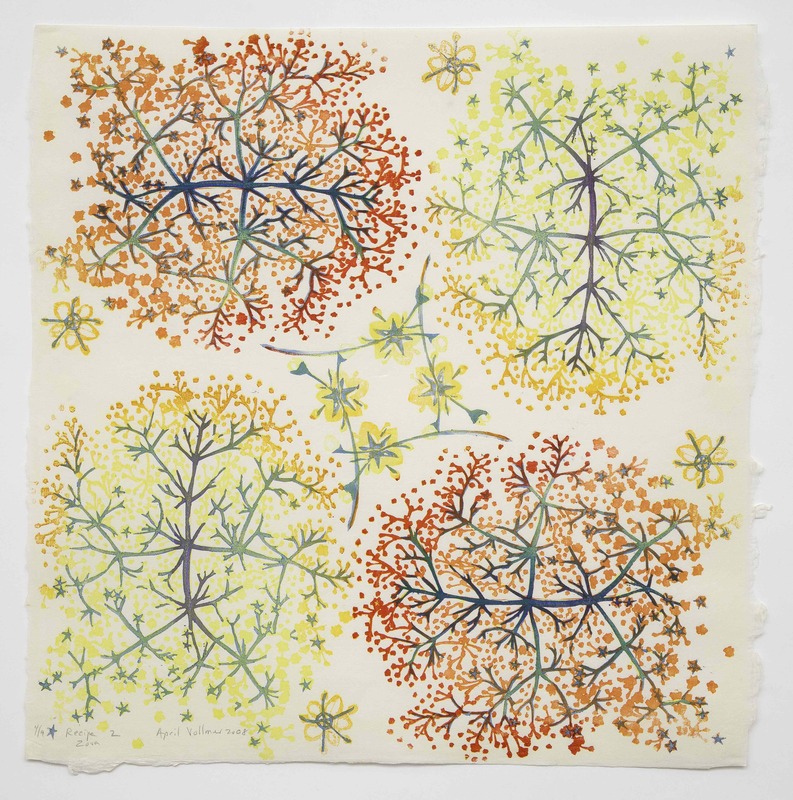 Her work has been published in journals including Science, Printmaking Today, Contemporary Impressions and Art on Paper. Her prints have been exhibited at AIR Gallery, the Islip Art Museum, Kentler International Drawing Space and internationally. In 2004 she participated in the Nagasawa Art Park Program in Awaji, Japan, and in 2014 was the first writer in residence at the Mokuhanga Innovation Laboratory in Kawaguchi, Japan. She was on the boards of the first and second International Mokuhanga Conferences in Japan 2011 and 2014 and currently holds the title of Communications Attaché for the organization. An artist and printmaker working primarily in Japanese woodblock, I often combine woodcut with other media. While I am devoted to the hand techniques of traditional printmaking, I rely on the computer to initiate most of my projects. I photograph objects and scenes of personal significance and use the processes of printmaking to transform these images into something more abstract. I often repeat images of flowers, insects and other elements of nature to create radial patterns. I also incorporate architectural plans, mosaics, ceramic objects and other items from my study of art history. Ideas for new work come from travel to Serbia, Japan, Italy, India and elsewhere. Each year I add to my library of woodblocks and print them in combination with older blocks to build complex autobiographical patterns. April Vollmer Japanese Wood Block video by Dempsey Rice.